7401 - 1.25" embroidered star patch. Measured tip of one point to the tip of the point across. Navy Blue, Royal Blue, Gold, Metallic Gold, Red, Metallic Silver, or White. Patches sew or iron-on & are carded for a display rack for retailers. 7402 - 1.75" embroidered star patch. Measured tip of one point to the tip of the point across. Navy Blue, Royal Blue, Gold, Metallic Gold, Red, Metallic Silver, or White. Patches have an iron-on backing & are carded for a display rack for retailers. 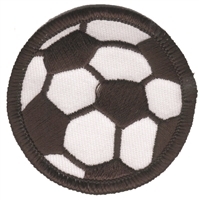 7952 - 2" soccer ball embroidered patch. Patches are carded for stores to hang on a display rack. Made in USA. 8478 - hiking turtle embroidered sew on patch - 3.25" tall x 1 15/15" wide - Patches are carded for a retail display rack. Made in USA. 8754 - KISS MY BASS novelty embroidered patch. 4.5" wide x 2.5" tall - Patches sew or iron-on & are carded for a retail display rack for stores. Made in USA. 7439-58M/01 - maltese cross embroidered patch: 2", metallic silver on black. Patches sew or iron-on & are carded for a display rack for stores. 7439-36/01 - maltese cross embroidered patch: 2", red on black. Patches sew or iron-on and are carded for a display for retail stores. 7439-58/01 - maltese cross embroidered patch: 2", silver-grey on black. Patches sew or iron-on & are carded for a display rack for stores. 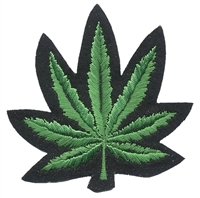 9401 - marijuana pot leaf embroidered patch. Patches sew or iron-on & are carded for a display rack for stores. 3.375" x 3.375"
0201-21M - Metallic gold scrambled eggs patches for cap visors. Each of the two "eggs" measures 4 1/16" x 1.125". Patches iron-on & are carded for a display rack for stores. Metallic silver scrambled eggs patches for cap visors. 0201-58M - Metallic silver scrambled eggs patches for cap visors. Each of the two "eggs" measures 4 1/16" x 1.125". Patches iron-on & are carded for a display rack for stores. 7420-01/39 - peace sign - 3". Patches sew or iron-on and are carded to hang on a display rack. 8213-39 - rainbow gay pride flag with white border embroidered patch. 2.25" tall x 3.625" wide. Patches sew or iron-on & are carded for a display rack for stores. 8213-01 - rainbow gay pride flag with black border embroidered patch. 2.25" tall x 3.625" wide, black border. Patches sew or iron-on & are carded for a display rack for stores. 0201-21 - Gold rayon eggs for cap visors. Each of the two "eggs" measures 4 1/16" x 1.125". Patches iron-on & are carded for a display rack. 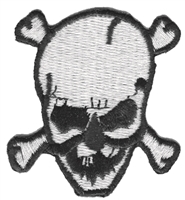 skull patch- 2.125" x 2"
7435 - skull & cross bones embroidered patch. 2.125" x 2". Patches sew or iron-on and are carded to display on a retail store rack. 7419-01 - Skull embroidered patch on black twill. 3". Patches sew or iron-on & are carded for a display rack for stores. smile face fun embroidered patch: 2.5"
7479/2.5 - smile face fun embroidered patch: 2.5" . Patches sew or iron-on & are carded for a display rack for retailers. 7479-01/2.5 - smile black face fun embroidered patch: 2.5". Patches sew or iron-on & are carded for a display rack for retailers. 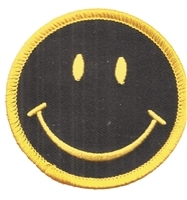 7429 - smile face embroidered patch - 2" - Patches sew on & are carded to hang on a display rack for stores. Made in USA. 0-0920 - SUPER GENIUS embroidered patch. This has been commonly available only on Interstellar Propeller beanies. It now is available as a patch (or we can sew it onto an Interstellar Propeller beanie). 2" tall x 3" wide. Patches sew or iron-on & are carded for retailers to hang on a display. White rayon eggs for cap visors. Each of the two "eggs" measures 4 1/16" x 1.125". 0201-39 - White rayon eggs for cap visors. Each of the two "eggs" measures 4 1/16" x 1.125". Patches iron-on & are carded for a display rack for stores. 7425 - yin yang souvenir embroidered patch. 3". Patches sew or iron-on & are carded for a display rack for stores.